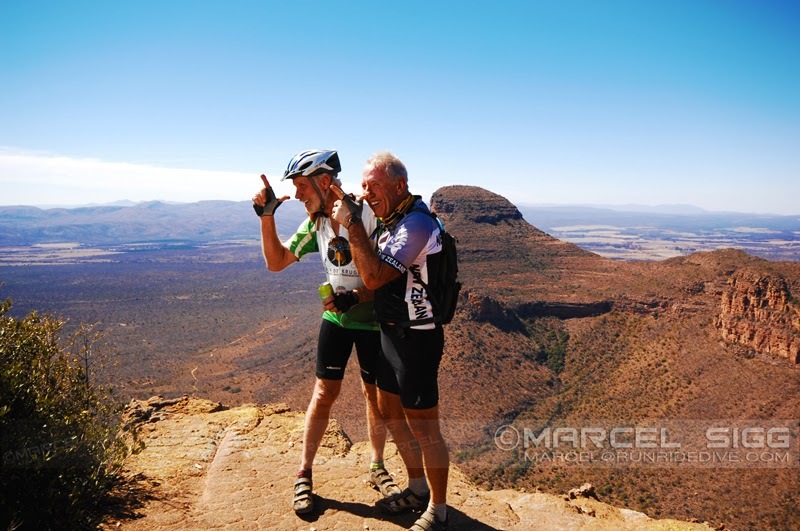 Located about two and a half hours outside Johannesburg, in the Limpopo province, is a little piece of Eden known as the Entabeni Private Game Reserve located in the Waterberg, coincidentally, the venue of the MTN Tour of Legends mountain bike ride. 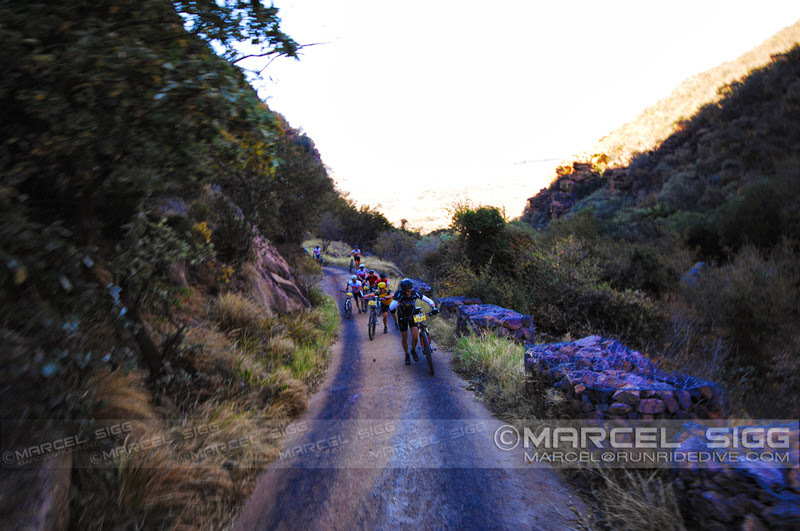 nature has provided as a backdrop for this ride through some of the most scenic vistas imaginable. Hidden away in Limpopo, the province of catastrophic education system failures, MTN has decided to co-sponsor an event to enable mountain biking enthusiasts in the higher echelons of corporate South Africa to engage in a sport they love, surrounded by beautiful scenery, while being accommodated in fantastic lodgings with heated bathroom floors, satellite television and mountains of buffet food for the second year running. First of all, I should probably confirm what the more astute reader already suspects and confirm that I didn’t ride this event. I sat on the back of the media Land Cruiser with my assortment of cameras and lenses and tried to capture the event in images for you. I use the term “sat” very loosely. In our endeavours to keep up with the front runners, our driver, Ranger Sean, raced along all kinds of off-road terrain. I think it’s fair to say, and all the other media persons on the vehicle can confirm that we pretty much held on for dear life as we bounced around, much like the ball in a pinball machine and still we were not able to keep in touch with the podium finishers, Team EAI, Blackberry and Columbia. Riders competed in pairs, the clock stopping when the second rider in the team crossed the finish line. If you need any proof that this is a ride and not a race, the organisers stopped the clock for all the competitors on the Friday and Saturday routes so the riders could enjoy themselves, take a breather if you like, soak up the incredible scenery surrounding them, take on some refreshments and nourishment and if the mood strikes them, do a little boogie while waiting for the Ferry (on the Friday). Saturday’s clock stopping rest stop and watering hole had a completely different feel to it. I suspect the riders also appreciated the opportunity to rest up a little more because the route for Saturday included an absurd gradient up to a plateau and back down again. The opportunity to park your bike, have a cold drink and some energy packed foods while gazing over the plains below, which was breath taking, would’ve allowed the riders to regain some energy before carrying, yes I said carrying, their bicycles over a ridge to ride down a single track on the other side. The view from the lookout is truly spectacular. 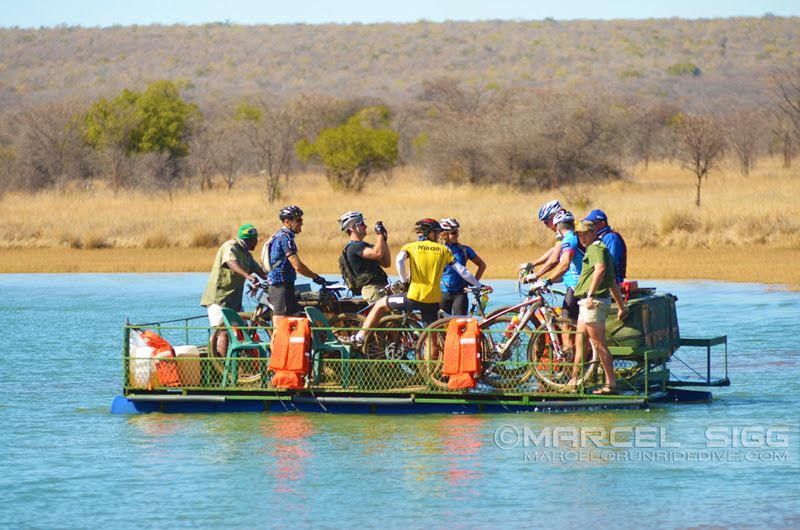 princely sum of R76,000 was raised from the sale of the somewhat soiled bicycle after dinner on Friday in the “Kraal”. 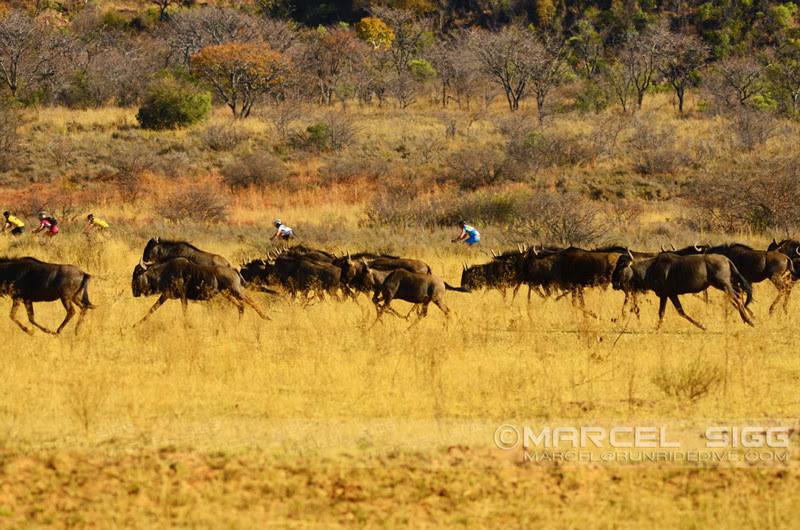 A herd of wildebeest run between the media 4×4 and the riders on their way to the insanely steep climb called Yellow Wood. well into the night. Some retiring to their lodgings only hours before the final stage on Sunday. Range Rovers and other similar vehicles. 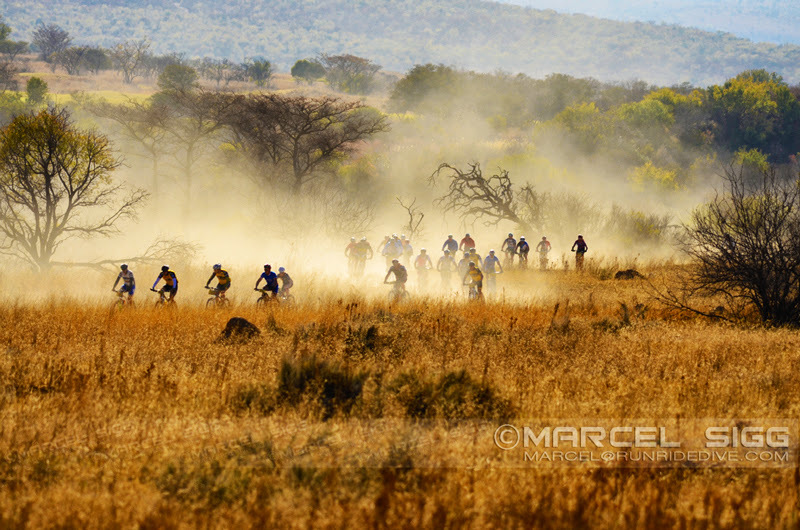 The cyclists speeding along the zigzag path cut into the African plains churn up a fair amount of dust. tremendous strides in addressing the various socio-economic challenges faced by multitudes of disadvantaged communities across South Africa. 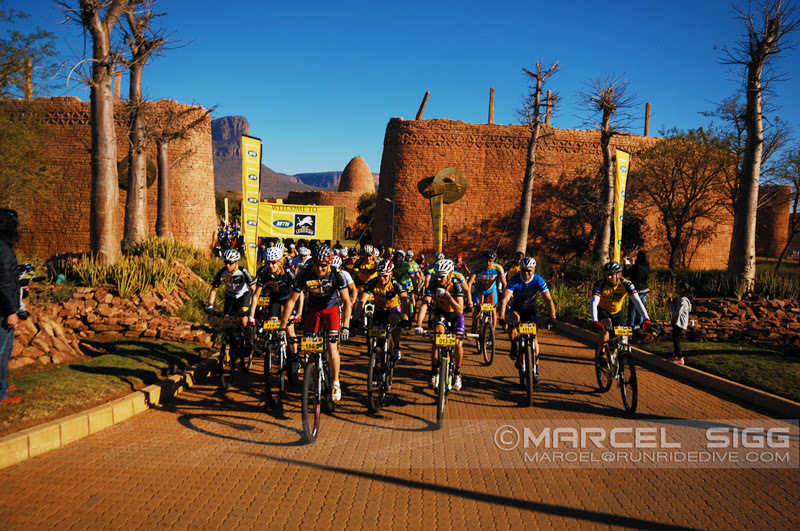 MTN along with the Wildlands trust, sees the MTN Qhubeka project not only focused on mobilising business potential through our communication solutions, but also on mobilising and uplifting communities around the country one bicycle, one tree at a time. Please feel free to leave comments below, on our Facebook page or via Twitter.